Jennifer Sharpe is a divorced mother of two with a problem just about any working parent can relate to: her boss expects her to work as though she doesn’t have children, and her children want her to care for them as though she doesn’t have a boss. But when, through a fateful coincidence, a brilliant physicist comes into possession of Jennifer’s phone and decides to play fairy godmother, installing a miraculous time-travel app called "Wishful Thinking," Jennifer suddenly finds herself in possession of what seems like the answer to the impossible dream of having it all: an app that lets her be in more than one place at the same time. With the app, Jennifer goes quickly from zero to hero in every part of her life: she is super-worker, the last to leave her office every night; she is super-mom, the first to arrive at pickup every afternoon; and she even becomes super-girlfriend, dating a musician who thinks she has unlimited childcare and a flexible job. When I finished Wishful Thinking a few weeks ago, I immediately e-mailed Kamy Wicoff to see if she'd be at Book Expo America on the day that I was attending. I just had to meet the person responsible for this delightful story. Not only did Kamy fit some time into her schedule to meet me (although I have to wonder if she used a certain app...), but she was also very friendly and gracious! 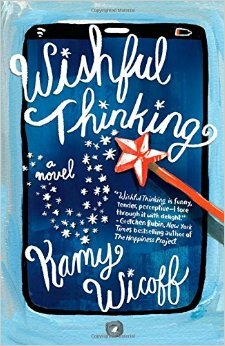 Wishful Thinking is a clever and entertaining debut novel. Even with being married, I could still relate to Jennifer's struggles to keep everything in her life going smoothly. Realistically, it's impossible for working parents to be in two places at once. Finding childcare can be so stressful, especially when it falls through at the last minute. There's also the extra-curricular stuff that I can't even get my kids involved in because of the timing with my work schedule. And let's not forget getting time off for all the appointments and other things that only happen during the nine-to-five workday. Wouldn't we all be happier with an app like "Wishful Thinking," whether we're parents or not? I can think of many, many times it would have come in handy! I loved that the story wasn't predictable. I thought it would go in one direction and then a surprise came into place, throwing off any predictions I might have held onto until that happened. The secondary characters were well developed and I enjoyed seeing Jennifer interact with all of them. Her kids seemed so realistic and reminded me of my own kids. There was even an aspect of the story that made me think of one of my favorite television series, Orphan Black. The only criticism I have is regarding the explanation of time travel. Given that I over-analyze how things worked in Back to the Future, time travel is usually perplexing to me. In this instance, Jennifer is time traveling within the same day to be in two--or sometimes even three--places at once. I had trouble wrapping my head around all the rules and details involved. I will admit that Kamy's approach to the explanation was creative and she definitely put a lot of thought into it. Since I didn't do too well in high school physics and have since forgotten most of what I learned, I just have to trust that she knows what she's talking about. Overall, I loved Wishful Thinking and have been recommending it to everyone who is in need of something new and fresh to read. I even included it in a list of favorite time travel novels over at Julieverse. Fans of The Balance Project (by Susie Orman Schnall) and The Status of All Things (by Liz Fenton and Lisa Steinke) will enjoy this story for sure, as will anyone who wants a bit of escape from reality with a real life lesson that makes you think. Thanks to BookSparks for the book in exchange for an honest review. 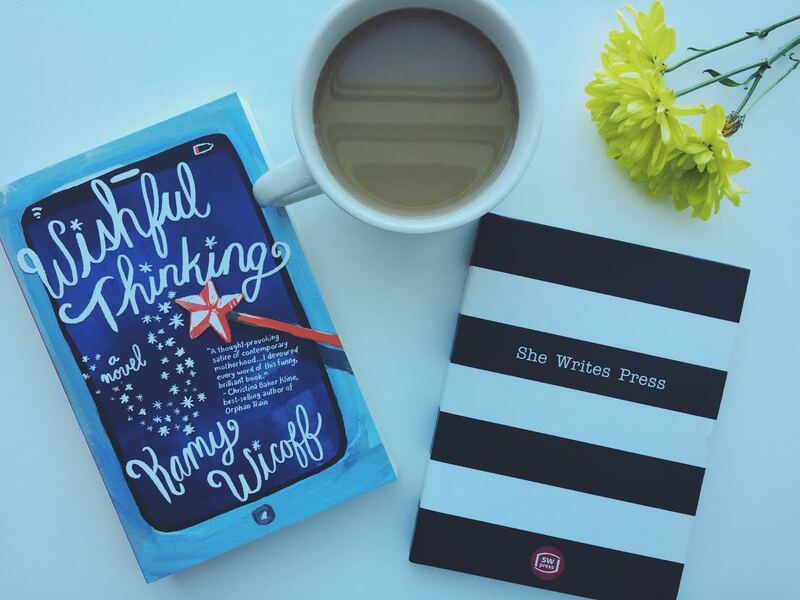 They have one copy and a journal from She Writes Press (of which Kamy is the founder) to give to one lucky US reader! US only. Giveaway ends June 22nd at midnight EST. An app that would do my housework for me and obviously this would also be free and accompanied by a hot man with a feather duster and not much else! I think an app that would tell you the mood of those around you would be extremely helpful! To get an alert that your coworker was cranky and you shouldn't even say good morning, or that your hairdresser is sad because she just broke up with her boyfriend could really make a difference in how you move through your day and avoid some situations! I would definitely want a laundry app. I spend far to much time washing, drying, folding ironing, hanging and perpetually putting laundry away. I would want an app to make my cats sleep later in the morning. I can't remember the last time I slept past 5 in the morning. A do-over app with no limits. Meaning you could do over your day, your hair, the dinner you just cooked or a year. Or something else. An app that would clean my house. i would love an app that would ask the family what they want for dinner. the choice with the most votes would be figured out, and all the ingredients would be figured out. if we were missing anything, it would pre-order them from the grocery store for pick-up. There is no such thing but I would love a clean the house app especially for the bathrooms. I would love an app that would give me a chance to hear what it's like as a normal hearing person. An app that tells me I need to shut it off. Yeah. I need an app for cooking and cleaning!!!! I would like an app that would allow me to input what I want to eat for any given meal. Then someone would go buy the groceries for it, prepare it, and deliver it to me! An app that would do the cleaning and don't forget the laundry! An app that doesn't necessarily slow time down, but slows me down. Sometimes I think I am just always rushing because I have done it for so long. An app that cleans my home and does laundry. An app that would organize my everyday life and travels and foods and oh books!! A cleaning app would be good. But I could also use an app which would direct me to people near me who need help and what sort of help is needed. Then I could be a modern day super hero, dole out the help, and head back to my house without anyone noticing. An app that will help me in learning how to cook. Step-by-step instructions, also telling me when I'm messing up. I'd want an app to constantly nag me to get up, out, keep on moving, and turn this boat around.